The village of Drăguș had plenty of surprises in store for us. 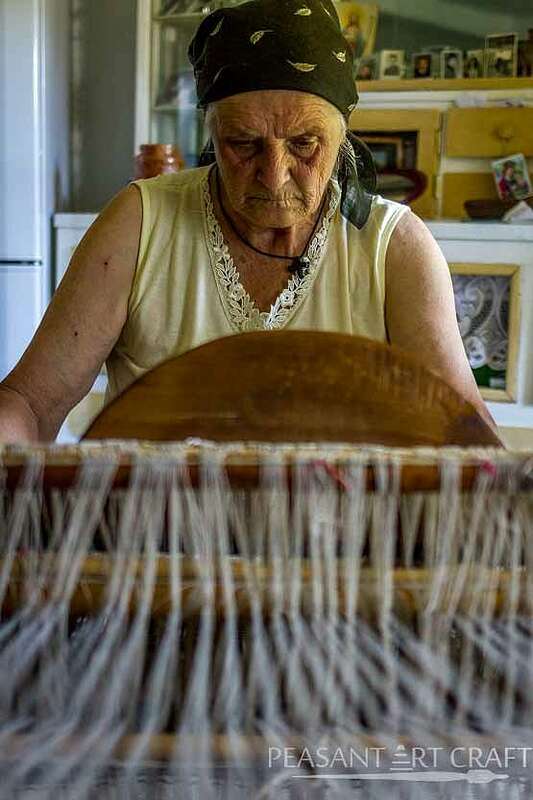 From amazing weaving art experience, then off to meet the traditional Romanian coat maker Dumitru Sofonea, visiting Drăguș was an incredibly rewarding experience. In the company of our dearest Viorica Fogoroș, whose weaving skills awed us, we made our way to the coat maker’s workshop. We found him taking a rest. The room was very spacious and clean. On the loom next to a window sat his wife, 77 years old Sofonea Valeria. Framed black and white pictures hanging on a place of honor on the wall above a worktable bolster their memories of the past. „The man sitting at the table is Dumitru Sofonea, my father in law. He was 80 years old in 1970.”, says Valeria while pointing to the coat maker in photograph. „Behind him, you can see me and my husband, named after his father, Dumitru Sofonea”. Born in 1935, Dumitru Sofonea not only inherited his name from his father, but also his skills. Dumitru Sofonea’s passion for coat making started at a young age, observing his father’s flawless seams. As he grew up, his father often required him to help with various tasks, such as embroidery. Over the years, his jackets were sought by collectors all over the world. Among the family’s most illustrious customers were King Michael I of Romania and Leonard C. Meeker, Harry G. Barnes and James Rosapepe, three American ambassadors to Romania. Defined by UNESCO as „talented tradition bearer and practitioner, contributing to the transmission of his knowledge and skills to the younger generations”, Dumitru Sofonea was named a Human Living Treasure in 2012. The support of his wife also contributed to the success of the business. Sitting on the edge of the bed, Dumitru Sofonea, now 83 years old is watching and listening in tears as his wife keeps telling their story. Since September 2017, he stopped working due to a bad health condition causing him to take long rests. Named like his father and grandfather, Dumitru Sofonea, one of their five sons, is the third generation to take over. He led the family business to further success with his expertise, setting up a ski resort and an atelier in Drăguș. There, at Casa Cojocarului Dumitru Sofonea, the family – mother, father and son work together as a team, demonstrating the fascinating traditional sheepskin coat making Romanian sheepskin jackets process for visitors. A traditional Romanian coat can take three months to complete. They are made of sheepskin leather and are entirely hand sewn with motifs and colors specific to the village of Drăguș: red, pink, blue, green, purple, burgundy, black. The year the jacket was made and the owner’s initials are often sewn on pockets. Each part is handcrafted individually: the back, right and left sides, the pockets, then they put them all together. The pattern is sewn straight onto the jacket or on strips of leather, later sewn over the jacket and reinforced to prevent deformation.